NAUGATUCK — M. Blanche Vardon, 90, formerly of Beacon Falls, passed away Wednesday, Oct. 10, 2018 surrounded by her loving family. She was the widow of Rodney J. Vardon, who predeceased her after 34 years of marriage. Mrs. Vardon was born Nov. 12, 1927 in Waterbury, daughter of the late Angus and Martha (Hackney) Harkness. Blanche resided in Naugatuck for the last seven years and prior to that in Beacon Falls for 66 years. She was a member of the Beacon Falls Congregational Church, where she also served as a deacon. 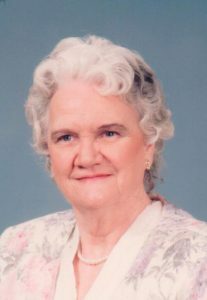 Prior to her retirement she was a therapeutic recreational program director at Glendale Health Care Center, mail contractor, and owner of Bluebird Trucking. Mrs. Vardon served her community as a justice of the peace, Park and Recreation commissioner, and on the Republican Town Committee. She was a past chief daughter of the Daughters of Scotia Lady MacAlpine Lodge #70, Girl Scout leader, and Camp Fire Girl leader. In her free time, Mrs. Vardon loved sewing, crocheting, cake decorating and reading. She will be deeply missed by all of her family. Blanche is survived by two sons, Steven R. and his wife, Judy Vardon, of Beacon Falls, and Rodney Vardon Jr. of Oxford; three daughters, Judy V. Berge of Beacon Falls, Susan R. Vardon of Naugatuck, and Diana V. and her husband, Tony Malone, of Naugatuck; a sister, Margaret H. Spina of Spring Hill, Fla.; 10 grandchildren; 12 great-grandchildren; and 20 nieces and nephews. Besides her husband, she was predeceased by her infant son, Richard John (Dicky) Vardon; granddaughter, Vanessa Sue Malone; four brothers; and two sisters. A Celebration of Life Service for Blanche will be held at 3 p.m. on Sunday, Oct. 14, 2018 at Beacon Falls Congregational Church, 69 Wolfe Ave., Beacon Falls. Family and friends are asked to meet directly at church. A private graveside service will be held in Pines Bridge Cemetery at the convenience of the family. The Alderson-Ford Funeral Home of Naugatuck, 201 Meadow St., is assisting the family with the arrangements. Donations in her name can be made to the Beacon Falls Congregational Church, 69 Wolfe Ave., Beacon Falls, CT 06403, or Beacon Hose Company No. 1, 35 North Main St., Beacon Falls, CT 06403.